Lactase tablets make it possible for lactose intolerant people to be able to eat dairy products without the problems normally associated with products containing Lactose (Milk sugar). LACTASE is an enzyme which digests (breaks down) the milk-sugar lactose so that it can easily be absorbed . 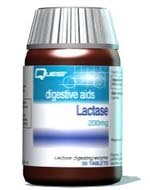 QUEST LACTASE may be chosen by people who have difficulty digesting the lactose found in milk and dairy products. Take 1 to 2 tablest with meals containing milk or dairy products.